Pursue your passion with the pros. Experience the advantages of working with professional musicians and music educators from a variety of different backgrounds and specialties. The Darlington Arts Academy's curated instruction and performance opportunities open the doors of musical enrichment to students of all ages and levels of experience. The Arts Academy is open to Darlington and non-­Darlington students. The harmony of practice and pedagogy. The Darlington Arts Academy offers private instruction to students in piano, woodwinds, brass, percussion, strings, guitar and voice once a week for 12 weeks during each semester. Parents, faculty and members of the community are also welcome to enroll. One-on-one instruction tailored to your needs. Six-week group lessons in visual art are available to student groups of six or more. Dance lessons are available to Upper School students in partnership with The Dance Centre. Elite musical training in harmony with a Darlington education. The Darlington Arts Academy offers a 10­-month Conservatory program as an extracurricular opportunity for Upper School students. If you see yourself as first chair in the Philharmonic one day, this is where you belong. The Conservatory enrolls highly motivated student musicians who share a common goal: to obtain a premier college­-preparatory education and elite musical training within a single, comprehensive program. 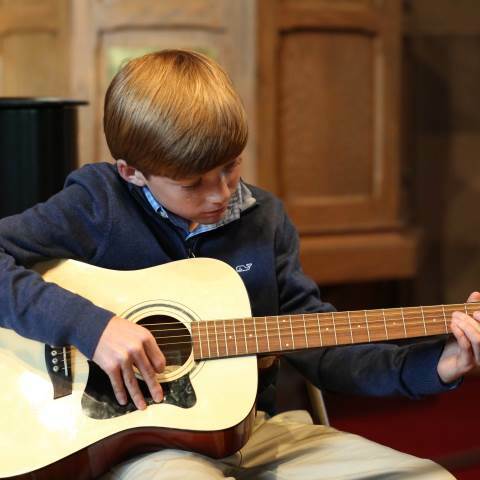 The program provides an after-­school experience to support practice, music theory and history study along with added performance opportunities. Conservatory meets for an hour­-and-a-half Monday through Thursday afternoons. Please Contact Will Camp for more information. Get detailed information on tuition and payments for The Darlington Arts Academy. Have questions about the Arts Academy? We'd love to hear from you! Click below to ask a question. See what our Arts Academy students have been working on lately.